I have this tshirt that I love from Dogfish Head, the brewery. It has the classic image of the pork with the various cuts drawn out, but instead of labeling the parts of the pig with butcher’s terminology, the parts are labeled with the names of DFH brews. It’s a great shirt. Once, while wearing that shirt in a hotel elevator, I had a nun (really) give me a nice long once over and ask, seriously, “so are you on the pork council?” I politely shook my head no, stepped off of the elevator and laughed all the way down the hall. I don’t think you get to be on the pork council simply by way of enthusiasm for the product, but IF ONLY. Needless to say, when the North Carolina Pork Council contacted me to see if I was interested in working with them to promote the different ways to prepare pork, I jumped on the opportunity. Because I love North Carolina and pork. It’s a win win. 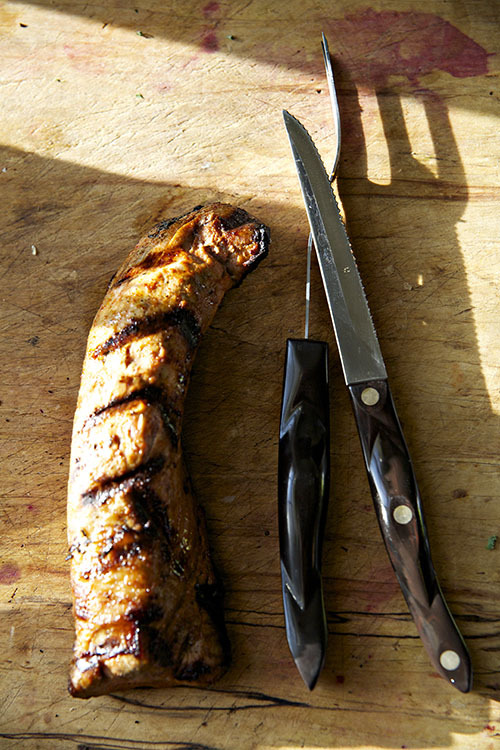 This month’s featured cut is the tenderloin, a cut that is as tender as the name implies. 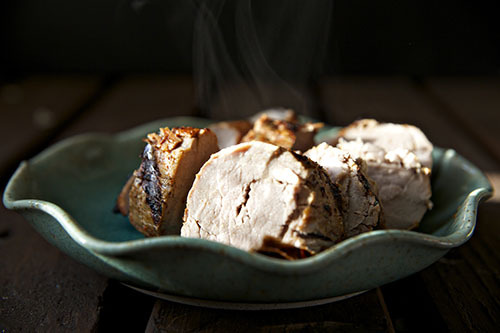 Tenderloin is something that I usually associate with roasted apples and fall holidays, so the challenge of creating a recipe for this time of year was exciting. We decided to marinate the meat with limes and chipotle and grill it, which created a crisp blackened skin and a moist, juicy cut of meat. Served with wilted turnip greens fresh from the Columbus County Community Farmer’s Market and crispy smashed potatoes, this was a perfect summer meal. 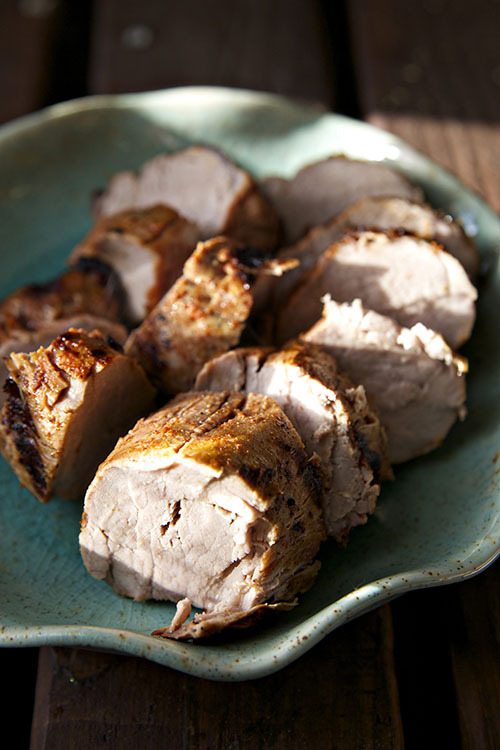 6-12 hours before serving, combine pork, chipotle powder, lime juice, and oil in a bag. Refrigerate, turning occasionally. Heat the grill to med/high heat or 375F. Grill for 6 minutes on each side, or until an internal temperature of 140-145 is reached. Remove from heat and let rest 20 minutes before slicing and serving.